I decided to stay in a homestay as I usually like to stay in accommodation that reflects the country’s culture. 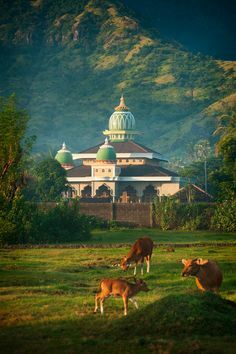 Rumah Roda Homestay is a traditional Balinese family compound where three generations live on the property. The pool and garden separated the family living quarters from the homestay allowing some privacy. Rumah Roda is situated on a quiet lane and walking distance to the busy main street. Nearby a ten minute walk takes you to the rice fields. The Homestay overlooks a tropical garden surrounded by Hindu statues and a delightful swimming pool. The rooms were very large with a bathroom, air-conditioning, fridge and a large terrace. The cost for one night is from IDR400,00 (about US$23) which included breakfast. A restaurant is open all day overlooking a lane where you can view daily Balinese life. Tea or coffee is available all day, Balinese coffee is delicious. In the mornings I walked in the heat, visiting temples and sightseeing. Afternoons I relaxed on the lovely terrace outside my room, overlooking the rooftops, writing in my diary and reading a good book. 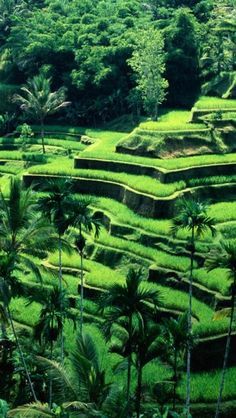 A small temple nearby would play Balinese music every evening creating a Balinese ambiance – I was in Paradise. 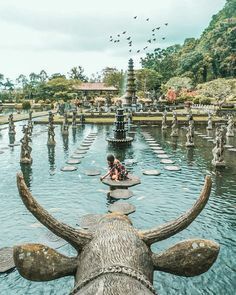 Whilst I was staying here there was a three-day Hindu festival called ‘Gulungan’ The family decorated the statues in the garden and made Bamboo decorations that lined the streets of Ubud. The family cooked me a traditional lunch consisting of Pork and Balinese vegetables. The family and the staff at Rumah Roda were very friendly and as I was travelling on my own; it was nice to have someone to talk to. 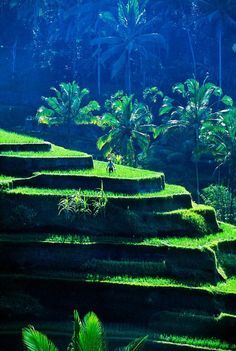 I took two trips with the owners son to Tellallang Rice Terraces and North Bali. Dharta the owner of the homestay speaks good English, is a character and was very helpful. Some of you have probably noticed that I haven’t written a post for a while. Reason being my health hasn’t been good as I have had Melanoma for the last nine years. I will try to keep the details short. 2008 I had a small brown mark removed from my left shin, results came back that it was Melanoma and had grown into the dermis the 2nd layer of skin, which means that it had probably spread into my lymphatic system. Also had a skin graft on my shin. One month later had eight of my lymph nodes removed from my groin and they found three of the nodes had cancer cells. Then had 20 days of radiation on my groin. Five years of no recurrence. 2013 I found a small lump on my shin, had surgery to remove it and another skin graft followed by 25 days of radiation. 2016 I found a large lump on the inside of my leg above my knee. Results from a pet scan showed that I had tumours sitting on my artery and vein in my groin. I had an eight-hour surgery which involved a vein graft as surgeons were unable to remove the tumour from the vein, but they managed to remove the one from the artery. Then I had extensive plastic surgery where a muscle was removed from my stomach and put into my groin, as I had tissue damage from earlier radiation and the muscle held everything in place. Two months later I had a Pet scan as I was having a lot of pain in my back. Results came back that I had a 5cm tumour in my stomach, cancer cells in my voice box, bowel and lymph nodes. I started Keytruda Immunotherapy Treatment at the end of December and after 11 treatments (7 months) the results have been good. My last CT scan showed tumour in my stomach had gone and all lymph nodes clear. My treatment has been temporarily canceled as I have a small problem with my kidneys which is a side effect of the treatment. I have changed my diet cutting out sugar and dairy, don’t eat much meat and have I lost 9kg. As I am now feeling healthier, hopefully, I will get back into the swing of things, I miss blogging and my online friends. Daphne Sheldrick who has devoted her life caring for wildlife in Kenya. You can read her story here. After relaxing for three days in my Fare I started to get itchy feet. So I decided to rent a car for three days from the owners of the Fare. Moorea is about 10 miles in width from the west to the east, it took me about one hour, twenty minutes to drive around the island. Driving on the right, with the steering wheel on the left was challenging, but the roads were quiet and the speed limit is 65km. I had one bad experience where I drove for about thirty five minutes to find a restaurant that was open. It gets dark at 6.30pm and the time I finished dinner it was dark and started to rain quite heavily, there is hardly any street lights and I couldn’t see a thing. It was very scary but I made it back safely to the Fare. As I was driving around the island it seemed like every corner I turned there was another amazing Jagged Volcanic Mountain. The scenery was stunning. The first European to arrive on the island were Englishman Samuel Wallis and James Cook. Captain James Cook first settled on Tahiti and then he took his ship with Samuel Wallis and went onward to Mo’orea. He first landed in ‘Ōpūnohu Bay, Cook’s Bay was later named in his honor. Parts of the 1984 movie ‘The Bounty’ (starring Mel Gibson) was filmed in Opunohu Bay. November’s art swap was to create two pieces of artwork using text pages. I used a page from a 1950’s children’s book for the elephant painting and a page from ‘Flow’ Magazine, for the Mandala painting. The paper is not glossy like some magazine and ideal for artwork. I used ‘Prima’ – Tropical water colors for both paintings. My swap parnter for this month Bernadette from Oregon sent me this very cute little note book. I booked this Fare through Airbnb, located on a French couples property on the Island of Moorea. Tahiti is known to be very expensive but this Fare was reasonably priced including breakfast and transfers to the ferry. The Fare was made from natural materials including a traditional thatched roof. The deck area was also a combined living area where you could enclose it with folding windows. Bedroom and bathroom was separate and also had an extra bedroom on a mezanne floor. The property located on top of a hill had a beautiful garden of tropical plants, fruit trees and chickens. I stayed in the Fare for six nights, the first three days it was quite overcast, but I was happy to just relax read books, do some painting and catch up on some sleep. The breakfast’s were delicious and I had enough left over for lunch, yummy French Bread and Cheese.